This website is intended primarily as a reference source for people who already know something about pesticides and their chemistry. I hope that this basic introductory page will enable people who know little or nothing about pesticides and their chemistry to understand the purpose of this website. When you buy a pesticide to use in your home or garden, or when a farmer buys a pesticide to use on his crops or animals, it is often a mixture of several chemicals. The chemical within this mixture that kills pests is normally listed in the small print on the label as the “active ingredient”. There are about 1800 different active ingredients of pesticides, and the purpose of this website is to provide a definition of each of those active ingredients. Apart from the active ingredient, the other chemicals in a commercial pesticide are not intended to kill pests, and there is no information about them on this website. These other chemicals are sometimes called “inert ingredients” and have various functions, for example to carry the active ingredient within a spray, a dust or a gel that is easy to apply, or to help prolong its shelf life, or to make it smell better. How are pesticide active ingredients named? When chemists want to give a specific and unambiguous name to a chemical, they use what is known as a “systematic name”. These names are often long and complicated, but they are necessary for naming the millions of known chemicals as well as the ones that have not yet been discovered or invented. There are 3 main sets of rules for deriving systematic names, two from the International Union of Pure and Applied Chemistry (IUPAC) and the other from the Chemical Abstracts Service (CAS). In addition to a systematic name, CAS assigns a Registry Number to each chemical that it includes in the index to its main database, Chemical Abstracts. Unlike a systematic name, a Registry Number does not include any information about the identity of a chemical. If you have a Registry Number and you want to know to which chemical it refers, then you have to consult an index. This could be the complete index produced by CAS, or a smaller index such as the one produced by the World Health Organization for drugs, or the one for pesticides on this website. For many purposes, a relatively short and simple name would be more helpful than a systematic name or a Registry Number, and that is the role of common names. Pesticide manufacturers submit proposals for names, and the ISO committee checks that the proposed names comply with the rules, are not misleading, and are not likely to be confused with existing names for pesticides or drugs. If no problems are found with a proposed name, then it is approved and adopted for use in many countries. Approved common names can be used on pesticide labels, in gardening magazines, in newspapers, in agricultural research journals, in abstracting services, and anywhere that does not require systematic names to be used. Common names do not belong to a company, and so anyone is free to use them. What can I do with the Compendium? The Compendium contains over 1800 data sheets (one for each common name), 15 indexes (listed on the home page), and 22 classified lists (one for each type of pesticide, such as herbicides and insecticides). The Compendium lets you check whether or not a name is a common name. Look for the name in the common name index. If it is not present, then it is almost certainly not a common name. If the name is present in the index, select it, and its data sheet will be displayed (perhaps with a different name from the one you used). The common name is shown as the title at the top of the data sheet. Just below the title there is a field called “STATUS”. Using imidacloprid as an example, this field tells you that the name has been approved by ISO and published in the standard with the reference number ISO 1750. If you point your mouse at the entry in the “STATUS” field, you can see additional information. Each data sheet gives you the systematic names and the Registry Number. Each data sheet also contains a diagram of the structure of the molecule, and gives you the molecular formula (the numbers of atoms in one molecule of the pesticide). The “ACTIVITY” field on the data sheet tells you the type of activity of the pesticide. 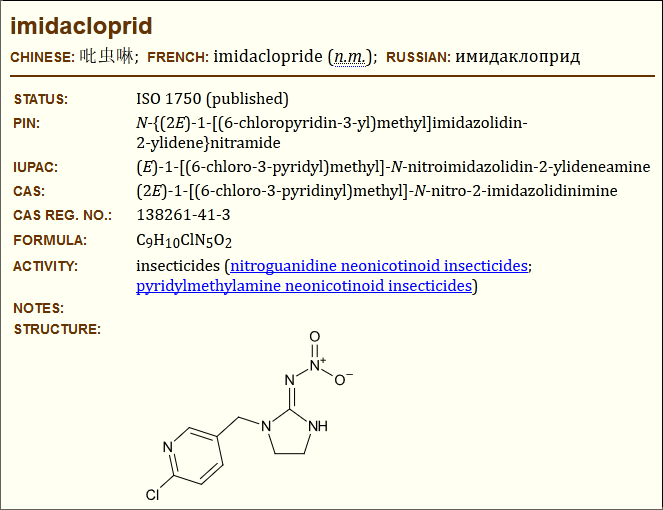 For example, imidacloprid is an insecticide, which is used to kill some types of insect. Other types of pesticide include acaricides (used to kill mites and ticks), herbicides (used to kill weeds), molluscicides (used to kill slugs and snails) and rodenticides (used to kill rats and related animals). On most data sheets, the “ACTIVITY” field contains not only the main type of activity, but also one or more chemical groups to which the pesticide belongs. Select one of the names of the chemical groups, and the data sheet will be replaced by a classified hierarchy of pesticides. 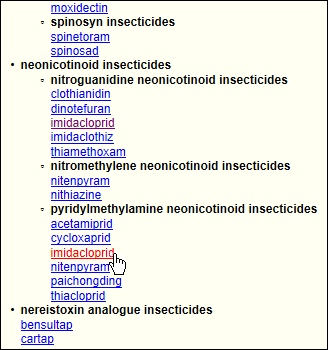 This will show you your selected pesticide together with a list of other pesticides that have similar activity and similar chemical structure. If you know the Registry Number for an active ingredient, then you can look it up in the Registry Number index. If you know a systematic name for an active ingredient, then you can try to look it up in the index of CAS names or the index of IUPAC names or the index of IUPAC PINs. However, these can be difficult to use unless you understand chemical nomenclature. Where can I find out about a brand name? The most prominent name on a pesticide label is normally the brand name (also known as the trade name). These names are almost always registered trade marks, and therefore belong to a company that manufactures or supplies pesticides. There are many thousands of these names, and there is no single place where they are all listed. Brand names are not included in this Compendium, because there are too many of them, it is impossible to keep track of them all, they sometimes contain different active ingredients in different countries, and the active ingredients are sometimes changed.